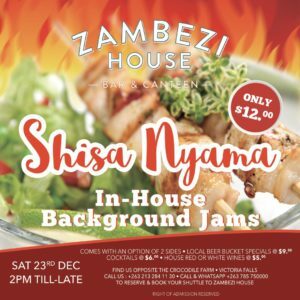 Shisa Nyama at Zambezi House – Zambezi House is an exciting casual dining café concept in Victoria Falls • Zimbabwe. A perfect addition to your festive weekend is a Shisa Nyama by the Zambezi River! Delicious food, cocktails and beer bucket specials! Black Panther the Blockbuster now showing. We are located at Plot 1392, Parkway Drive along the Zambezi Riverfront just before the entrance to Zambezi National Park and opposite the Crocodile Farm.